And the briefest race report. I’m going to just frontload this by saying that I don’t think late winter or early spring half marathons are for me. This is the third year in a row where I arrive at the start line very undertrained and crabby with myself for paying over $100 to race without having a real shot ay my goal time. So the previous two years, I was a little closer to said goal times but now I’m older and wiser and didn’t want to have a big blowup in the back of the race. This is good in a way because it makes me really examine my intrinsic and extrinsic motivations for running. And also think about how much I, as a Southerner living in the Northeast for the past decade (!! ), still don’t really like winter. We’ll see if anything changes on that front. Monday 2/4: It was a smidge warmer than usual but I missed a morning run and already had dinner plans at the amazing Krok for some spicy Isan Thai. I had the perfect view of the route to Brooklyn Bridge Park to watch all the runners go by as my mouth slowly burned. Tuesday 2/5: 3.4 miles on the Hudson River Park before taking a class on the erg at RowHouse. Wednesday 2/6: Lunar New Year dinner at Golden Unicorn. Thursday 2/7: Halal combo for lunch and dinner aka the best $6 ever spent. Friday 2/8: Flight to New Orleans with my friend Jay. We immediately started eating everything in sight, from chargrilled oysters at Felix’s to beignets at Cafe du Monde. There was gumbo, jambalaya, and baked ham at Mother’s. Everyone else arrived later that night while I caught an all-female brass band and saw my first (unofficial) Mardi Gras parade. Saturday 2/9: No shakeout, just more good food. Brunch at Ruby Slippers, more beignets from Cafe du Monde, carb loading with great pasta from Little Gem Saloon, then cheering on a Mardi Gras parade. Sunday 2/10: Race Day (oh, did you think I just came to eat? Pretty much). I showed up to the starting line downtown unsure of what to shoot for. I thought about going out at 9:00 minute miles then trying for a negative split for the last 5K, which would have been my 3rd fastest half marathon (maybe even 2nd). But honestly I didn’t really feel trained for that. So I decided to run the first mile however I felt, then evaluate from there. I hit it in 9:30 and didn’t feel like it was sustainable as the sun came out a bit (then slunk back into the clouds) and the humidity worked its magic, so I slowed to a 10:00 minute mile pace for the rest of the race. I had some King Cake from spectators around mile 6 and a Jell-o shot at mile 12, determined to have a little fun with it. We hung around the finish area as a group, enjoying the snacks and some free Michelob Ultra. After showering and a nap for me, we went back to Felix’s for more poboys and chargrilled oysters, drinks at Carousel Bar and Pat O’Brien’s, then several pounds of seafood at the well-named Cajun Seafood. All in all, not my best half marathon or even close, but definitely one of the most fun! I think it rivals and bests the Nike Womens San Francisco Half since the spectators wanted to get us drunk. Post-marathon, I signed up for the Ted Corbitt 15K as an attempt to get some race redemption under my belt in what remained of 2018. I hadn’t raced much this year and got PRs at the half marathon and 10K, but not any other distances (well, just the 5K and marathon that I actually tried). I came in to this pretty well-rested and had peanut butter toast and cold brew before. I didn’t pack any nutrition but figured I’d be fine. Last year, my first mile was super slow (9:44) due to getting into the corrals after they collapsed, so I made sure to get in there early this year. I accidentally started my watch early then couldn’t delete it in time. So I went in with an extra bit of seconds on the clock and was very confused with my splits the whole race. I managed to hold back a bit on the first mile then went way too hard on the 2nd mile. I finally got into a groove for the last two miles of the first loop and was feeling good (PPTC cheerers and volunteers really helped). Then I slowed down again for most of the second loop. The last mile felt tough but with the added endorphins from smiling and knowing that I was going to get a PR, then I was able to drop the hammer on the last 0.3 and sprint to the finish. The pace was a little faster than my 8:57 pace from the Bay Ridge Half 9 weeks ago, which was my A goal. However, it’s a little slower than it should be if you plug that half time into a calculator. My goal for my next half is closer to 8:48, so I’m hoping to bring it down as my volume and speed work comes up in the next 8(?) weeks or so. I’ve started some heart rate training since I have a HR monitor on my new watch. I’m surprised to find I kept it steady on this run (part of me is wondering if I had any cadence lock). To be discussed in future posts. 10/29: Rest Day. Went to Patavini and tried all the gnocchi. The blue one has spirulina and was really good! The truffle, saffron, and squid ink were my favorites. 10/30: 4.3 mile shakeout run @ 11 minute mile pace. I’d been running faster than my usual pace during the taper in part because of cooler temperatures and of course due to excitement. 10/31: Rest day and Halloween. Had street meat combo over rice for dinner near the Village Halloween Parade, 2.5 beers, then late-night pepperoni pizza. I went as a bat again. 11/1: Unintentional rest day. I was going to do a Saucony shakeout run (with Molly Huddle) but work was long and it was raining, so I bailed. I really should have done some treadmill miles at least. 11/2: Tracksmith popup in the morning, work, then Marathon Expo at night. I tried to get in and out quickly and spend less time on my feet. I picked up my official jacket then went to a friend’s birthday dinner at a Korean-Brazilian spot and turned down a lot of good wine. I went home right at 9 and got a solid 8 hours of sleep. 11/3: I thought about doing a shakeout but figured less time on my feet was a better idea after such a loose taper the last two weeks. I got Shanghainese for dinner: scallion pancake, soup dumplings, fried dumplings, rice cakes, noodles, and eggplant. I decided to skip a dessert with dairy just in case. 11/4: NYC Marathon Day. 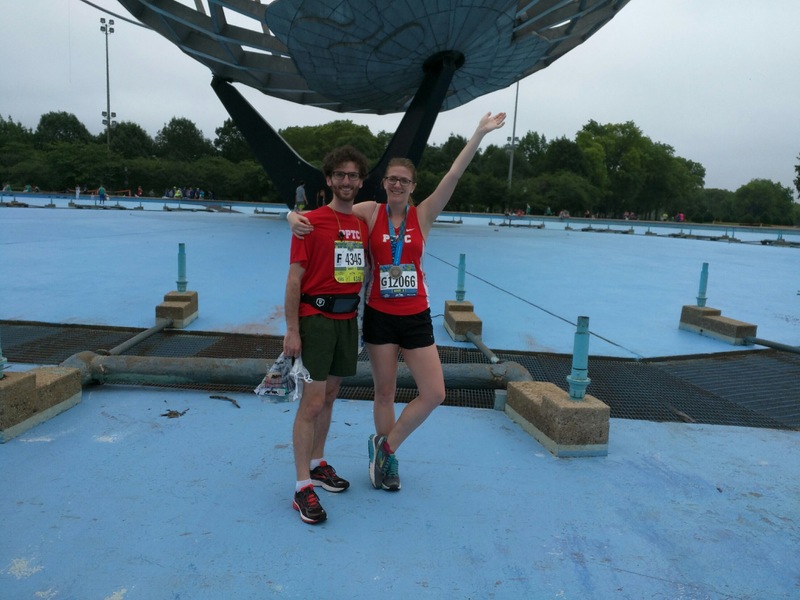 Race recap to come (hmm, I never wrote up one for the Bay Ridge Half). It was not my best marathon, but not my worst (it was my third). 4:31:40 and a huge positive split but I had a good time doing it. Total: 30.4 miles out of a prescribed 37. So this was technically Week 1 of Brooklyn Half training (3/12-3/18) but I was also taking a trip to LA with Gabby and didn’t manage to get in any runs before I left Wednesday 3/14. So this is mainly about our hikes and run in LA and all the things we ate! We flew in early Wednesday afternoon, dropped off our stuff in Hollywood, then headed in a very long car ride to Venice Beach. It was so nice to see and smell the beach! We then had dinner with some friends of mine at A-Frame, Roy Choi’s Hawaiian outpost in nearby Culver City. No pictures because we were starving but we had loaded fries, two kinds of spam musubi, Brussels sprouts, and crispy chicken. The next day, we took off on a Runyon Canyon hike. We took what we thought was the main route but then realized we were on the Eastern side of it. We figured out that we could keep going around the rim and back down but we had no idea how steep it would be. We made it! It was 2.8 miles roundtrip and 740 feet of elevation gain. After showering (I got some mud on my hiking leggings from bouldering and scooting down), we got some delicious ramen from Urban Ramen, bought snacks at Ralph’s, then walked to Hollywood to see the sights, namely the walk of fame and Mann’s Chinese Theater. Oh, and some churros. Later on, I had dinner with a friend at Bowery Bungalow, then ice cream from Scoops in Silverlake. On Friday, we headed to Universal Studios Hollywood. I was excited to see their version of The Wizarding World of Harry Potter after going to the one in Florida in January. It was almost exactly the same, down to the butterbeer (hot, cold, and frozen). We did the hour-long studio tour, which was super cool because I got to see Jaws in action and see the set of recent favorite The Good Place. Plus, huge donuts at Simpsons World/Springfield. We hit up the race Expo on the way back and got to see some more of Downtown LA. I got street tacos, finally (was on the hunt after seeing the LA taco episode of Ugly Delicious). And it rained, which we were totally prepared for in our hooded jackets and umbrellas. On Saturday morning, we ran The Big 5K, which is sponsored by Big 5 Sports and is affiliated with the Los Angeles Marathon (the next day). We signed up sort of on a whim, figuring that we were in town anyway and it would be a fun race. We didn’t look up the course profile until the day before the race because they didn’t really highlight it on the website. Now we know why. There were some brutal hills, especially for this relative flatlander. It starts off in the parking lot of Dodgers Stadium, then around nearby Elysium Park. According to Strava/Garmin, you are climbing for 33% of the time. Most of the first mile started out great and I was on pace for a PR. There was a slight downhill coming out of the parking lots, then boom, climb #1 just before 1 mile. I chugged my way up and hoped that was the worst of it. But of course, what goes up must come down. Then back up again. Then down. Then up. My grade adjusted pace for the first mile says it all; I went out hard then couldn’t hang on. Around mile 3, I got to laugh with other runners at what felt like an onslaught of hills. But I was pretty bummed that I couldn’t handle the hills. Gabby and I grabbed our medals and snacks (she got the swag bag, I passed on it not realizing I could have had another Clif Bar). Then it was time to eat! I tried a pastrami egg and cheese burrito as well as a smoothie from some food trucks that were there. I was tempted by the taco truck too, of course. We took a Lyft home, showered off, then headed back to Runyon Canyon for a gentler hike. We took the easy, paved road up this time then came down on the east side (where we had headed up on Thursday). It was a beautiful, sunny Saturday and so many people were out! It was impressed to watch all the runners, but we had a good time taking it easy and recovering. Lots of foam rolling that day! We had Korean BBQ bowls on the roof, coffee from nearby Blackwood Coffee, then I met with my friend Gina to hang out with her pup Riley and get donuts from California Donuts. Before we headed to the airport (I had a red eye), we stopped off at a mural that Mabelle had wanted to check out. And it’s right next door to See’s Candy factory and store. Then I spent the extra time before my flight screaming at the Houston-Michigan basketball game and eating chilaquiles. I missed out on all the NYC Half action, but I’m going to enter the lottery for next year. Mileage: 3.6 miles of running, most of it spent wheezing up hills. 4.6 miles of beautiful, sunny hiking. Freudian slip on my original post last week when I called it “Week 4 of NYC Marathon Training”. Whoops! Obviously I ran NYC last year and did the NYRR 9+1 this year for entry to the 2018 NYC Marathon, but this year the plan is to run Richmond. 8/21: RunCommutes are back! 6.4 miles home from work with my usual Lululemon ‘Run From Work’ backpack, very lightly filled. I missed my usual turn and cut through Commodore Barry Park and Fort Greene Parks. 8/23: Loop around the park, walk to the bar, then run home from the bar. 6ish miles total. 8/25: 4 easy treadmill miles in the AM. This is the first Friday I’ve run since May? June? 8/26: The most productive running day of my life. 1 mile warm up, then setting a new 5K PR at the Percy Sutton Harlem 5K, then running almost 10 miles through Central Park, down the West Side, and almost to the Governor’s Island ferry (but had to stop at the ATM first). I grabbed my stuff, decided to forego the free tshirt, and strapped on my new backpack (Gregory Maya 16) then headed out with a friend from my beer drinking running group. 14 miles even for the morning (I think) though my watch died at 9.3 and my running buddy forgot to restart his after we paused and we lost 0.3 then we stopped it before I had to SPRINT to the ferry, blue Gatorade in hand. I found my friends and we rented a 5-person surrey to ride around the island. Even after a big lunch and afternoon coffee, I was exhausted but somehow rallied to make it outside again later for frosé and beer with friends. 8/27: 3 recovery miles in Brooklyn Bridge Park after walking 2 miles to donate my bicycle in DUMBO. Total: 33 miles! My Sunday-Saturday total was 36.6 out of a recommended 34 miles. 7/31: Cross-training with tennis. More drills (I think my backhand is getting pretty good), more time to work on my atrocious serve. I’m nowhere near being ready to play against anyone, but am hoping that with more time, lessons, drills, and practice, that I could actually play next year. 8/1: I was heading to NYRR Open Run but decided to see if the new Park Slope Blink Fitness location was open and lo and behold, it was. And there were treadmills available. I did 4 easy miles while watching Teen Jeoaprdy! and quietly shouting out the answers. 8/2: Unexpected rest day because the Al Goldstein Summer Speed Series 5K #6 was canceled due to thunderstorms. My friends and I got delivery from Emily (their Emily pizza is in my top 5), stuffed croissants from Union Fare, and some fruit pies from Petee’s Pie Company. 8/3: Surprise mid-week 9 mile long run. I got out of a work training at NYU Langone Hospital early, so I put all my stuff into a locker at a Blink location (going to the gym twice in a week?!) then headed out along the East River. I was feeling good and the weather was perfect, so I knew I wanted to run more than 6 miles. I figured that since it would be likely raining on Saturday before/during/after Team Champs, I may as well get the miles in so I wouldn’t have to worry about adding extra on. I turned around at 4.5 miles exactly in between the Manhattan Bridge and the Brooklyn Bridge. Strava was being weird and generous and gave me an extra 0.2, but the wild loops around the piers to get extra miles in are all me. The 8:42’s are not quite right. I also had to do a lot of weird mini loops at the end of the East River path near 40th St. I’m hoping to do the East side from 59th St. up soon, but am happy to skip the 40’s and 50’s because there is no path. 8/4: Rest day. I thought about doing a few miles at the gym after work but picked up my bib then made it out to the grocery store and that was it. Had Burger Garage for lunch and was full for a long time. Burgers, sweet potato fries, and cookies & cream milkshakes aren’t really conducive to working out. 8/5: Team Champs 5 Miler in Central Park. Due to severe thunderstorms in the morning (I woke up early to the sound of thunderclaps and rain on my air conditioner), the men’s race was pushed to 8am and the women’s to 8:45am. I did a solo 1 mile warmup after cheering for the guys near the start. It was pretty humid, as is normal in August, so 1 mile felt sufficient, though I had hoped for two. Where’s Waldo at the start? I had a miserable 4th mile and stopped for water at each stop, then caught up to my teammate LP. She had her earbuds in so we didn’t really speak, but we sped up for the final mile and the part past our teammates together. I got a wave of nausea at the 4.85 mark, but managed to hold off. 8/6: 7 easy miles including a park loop in my PureFlows. This is the longest run I’ve worn them for because I’m hoping to make them my speed shoes for 5K/10K at most, but things felt pretty good in them. Total: 26.7 miles. It’s only 0.6 miles less than last week, but I know it was supposed to be a few miles more (and that last week was supposed to be a few miles fewer). Next week (week 3) is supposed to be the first above 30. 6/12: Recovery from Miami. I think I went to bed at 9pm. 6/13: 5.4 at MHRC The Distance. I was close but not quite to hitting my distance record for this class. I didn’t want to sacrifice any of the stretching for an extra 0.2, though. 6/14: 5.5 miles loop of the park with a friend at my easy pace. 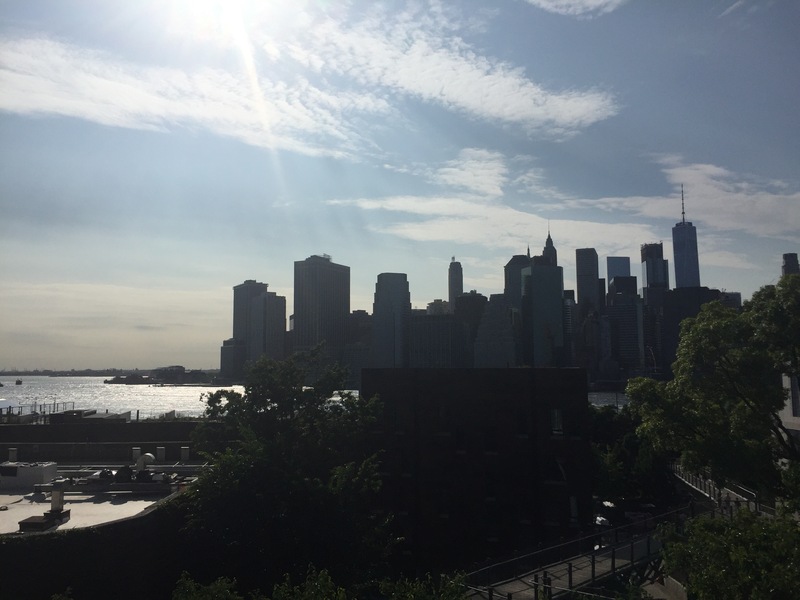 6/15: 5 miles around Brooklyn Bridge Park and the Promenade, then my first PureBarre class in a couple of months. It didn’t hurt to laugh the next day but I struggled through the push-ups. The instructor called my forearm plank form perfect, so that was a win. 6/17: 6.2 Queens 10K. I was hoping to do a warmup mile, but was being social then cheering on Wave 1 runners, then it was time to get into my corral for an 8:15am start. My A Goal was to PR which I knew I could do with even splits in the 8:40’s. Humidity was at 99%, so I decided not to be aggressive and push to the 8:30’s. The out-and-back was torturous, but I did see a lot of teammates who cheered for me, which really helped. I’m pretty proud of those splits! I got so lucky that it was overcast, which really helped with the high humidity. I would have wilted in full sun, as this course is pretty much out in the open. Finish time of 54:36, which is over a minute down from my UAE 10K. 6/18: 3 warm recovery run miles around lunch time, which I ended at Bagel Pub for a smoothie and an everything bagel with bacon cheddar cream cheese. Total: 25.2 miles and a new 10K PR. 6:20: Park loop at an easyish but too-quick pace for 5.5 miles. I really need to slow down my easy runs but it’s hard by myself without conversational pace. I’ve started saying the Pledge of Allegiance as a test. 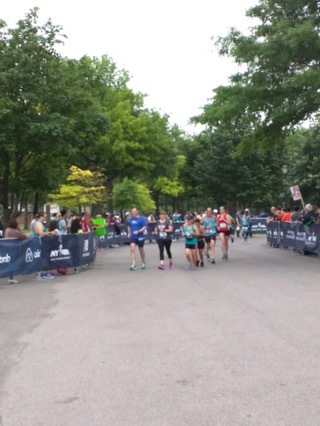 6/21: I volunteered at the 5K, originally having hoped to do a loop or a few miles. My left calf was hurting a little so I just did course marshal duty at the finish. 6/22: Fly 45 and trying a new-to-me instructor at Flywheel. I thought I had set a new “high score” for myself, but nope, not even close. I did get 2nd female in the one sprint, though. 6/23: Calf still a bit sore, so rest day. 6/24: Cheering at the Pride Run. I was hoping to get more miles in (4 or so) but it was pouring down rain until the race started. My socks and shoes were soaked, then the sun came out at the end of the race and I was hungry, so we high-tailed it to Tal Bagels, then home for a total of 0.44 miles. At night, I attended the Prospect Park Soiree and ate, drank wine, and danced the night away (ok, there was a 10pm hard stop with the DJ). 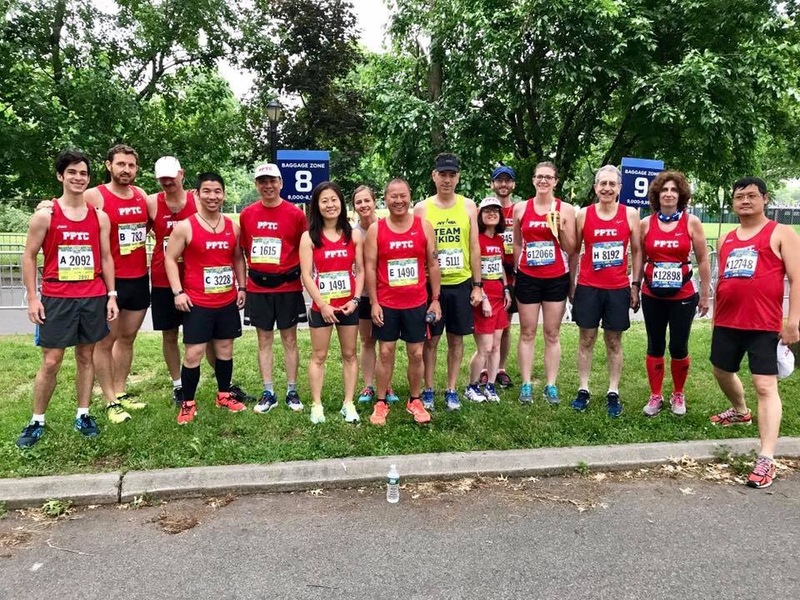 6/25: Achilles 4 Miler. 2 warm up miles before the start with some teammates. I accidentally got in one corral behind mine but decided to stick with it because I was already feeling thirsty and tired. My A goal was even splits in the 8:30s and I just wasn’t feeling it after the first mile, so I backed off. All the way off. I decided not to try to beat my 4 Mile PR from April and just try to get hydrated at each water station. No time for a cool down. 6 miles total but my calf was feeling normal again. Total: 12 miles. My lowest since a freak 11.9 mile week in April with only 2 runs.